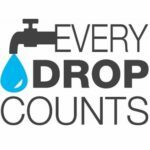 National Water Week – because not only Capetonians should be saving water! It’s National Water Week, and even though most South Africans are now aware of the severe drought and are hopefully doing their part to save water, I felt that it was nonetheless important for us to join in the BIG SAVE and give our readers a bit more information about the drought and some tried and tested water saving measures that they can easily implement at home. 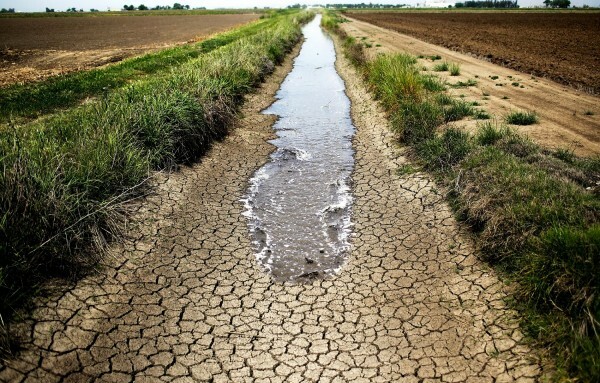 The provinces most severely affected by the drought are the Northern Cape, Western Cape and Eastern Cape, which have been declared disaster areas. However, Gauteng, the Free State and KwaZulu-Natal are heading in the same direction if they don’t manage and monitor their water supplies carefully going forwards. Hopefully Cape Town has given South African’s a much-needed wake up call. 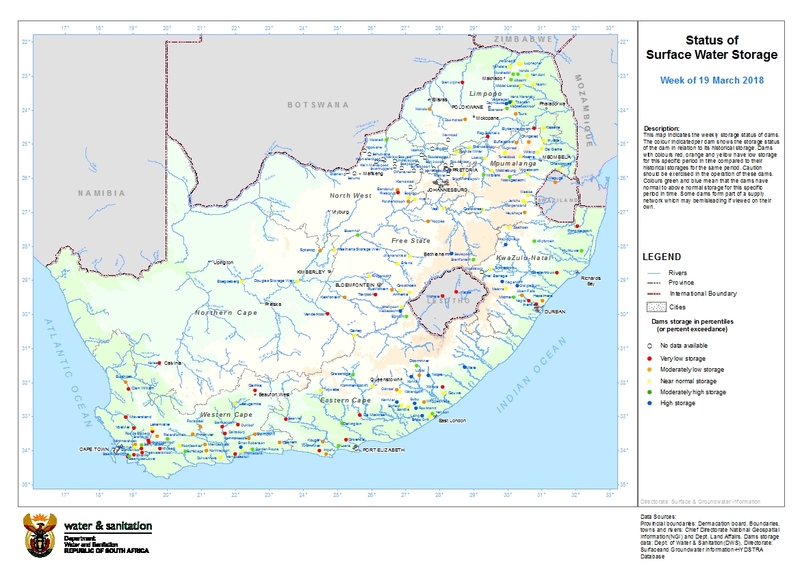 Another thing to note is that many municipalities within these provinces still have water restrictions, such as the City of Johannesburg (I know that seems hard to believe with all the rain we’ve had, but it’s true). Stay informed and go and have a look at this link to see if your municipality still has water restrictions being implemented http://www.droughtsa.org.za/about-the-drought/water-restrictions.html. The below map gives a clear indicator of the current surface water storage (i.e. dams) levels around South Africa. From this map one can easily see that the Western Cape storage is under the most stress, while the Eastern Cape is not far behind, followed by KZN and the Free State. It should also be noted that the Katse and Mohale dams, in Lesotho, are alarmingly low. Both these dams supply the Lesotho Highlands Water Project, which transports water from Lesotho into Gauteng’s Vaal system. It is concerning to see the Lesotho dams so low, not only for the citizens of Lesotho but also for Gauteng, which relies on supply from Lesotho. So be aware of your water usage Gautengers! In light of the drought conditions gripping our country, we have been brain storming a bit around how to bring the message of saving water home to people who still don’t think that it affects them. And we realised that we often only think about our water footprint, which is the total amount of water you use in your daily life (i.e. direct water use) but we don’t take into account our virtual water use, which is the amount of “hidden” water that is used to produce a product that we purchase. To understand this a little better, take a look at the graph below (courtesy of Rand Water and WESSA). 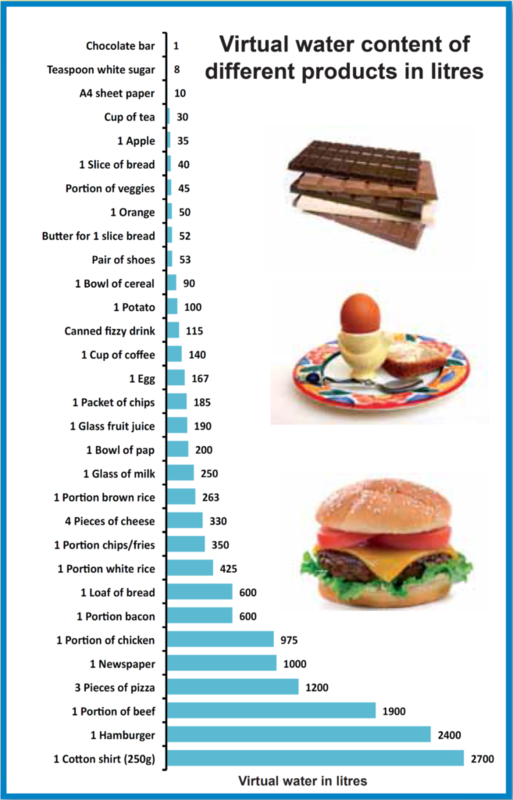 I think the lesson is obvious… we all need to eat more chocolate! But in reality, did you realise that your morning cup of coffee uses 140 litres of water before it sits in front of you, all tempting and delicious?! It’s scary how much water we are responsible for consuming when you start looking at our daily virtual water consumption in conjunction with our daily water footprint. Here is a website that calculates your water footprint for you. Fair warning, the results may shock you! So here are some of our favourite water saving tips – by the way, these are for all South Africans guys! Just because you live in Johannesburg, Durban, Bloemfontein, or some small town no one has ever heard of, and not Cape Town doesn’t mean you don’t need to be saving water. We all have to take responsibility for our water usage and think about the future of water supply in our water scare country! First and foremost – stop bathing! Bathing uses between 80 and 150 litres of water per bath, while a short 2-3 minute shower will only use ~30 litres of water. I never thought I’d be able to live without my baths but it’s not as hard as you think! Try to stick to one pot meals during the week. That means less boiling and less washing up. Keep an eye out for a one pot meal blog coming soon! And on that note try to only run the dishwasher when it’s full and fill the sink for washing up only when you have a few dishes to do, rather than one or two. Switch your shower head to an aerating shower head. They aren’t crazy expensive and you can buy them at Builders Warehouse. Their website now has an awesome water saving page , which makes it easy! You can also buy tap aerators from Faithful to Nature. If you are fortunate enough to have a garden or yard, consider getting a Jojo tank to collect rainwater, especially in Johannesburg, as we have been receiving so much wonderful rain! Please please please buy a cover for your pool! The amount of clean drinking water that is wasted filling up pools (hopefully not in Cape Town anymore, but elsewhere in SA) is horrendous and you could cut this down to almost zero by putting a cover over your pool to prevent evaporation. You can buy solar pool cover plastic (looks like bubble wrap) from Builders Warehouse at R89 per meter and probably for less if you shop around! Keep a bucket in your shower so that you can collect the water that runs while you’re waiting for it to warm up. You can use this to flush your toilet or water your plants. You’d be surprised at how much you collect. So those are our favourite tips! If you have any more good ideas please feel free to share them on our Facebook page! And keep up the good work South Africans, every little bit helps, just like every drop counts!